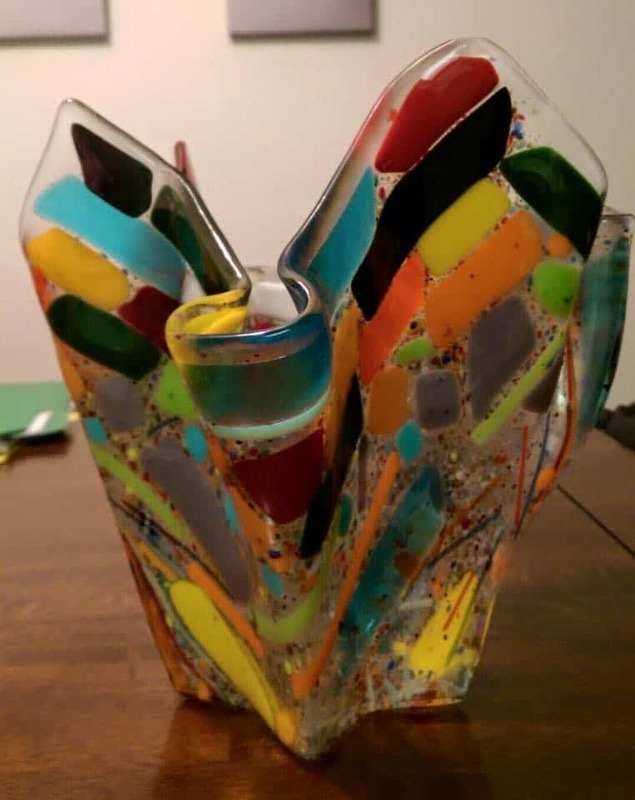 Ceramic and Glass Art Provides Family Fun in Kansas City! Are you ever stumped trying to think of a new family activity? It’s tough to get the kids away from the TV for creative, quality family time. Pinterest has lots of craft suggestions, but maybe you don’t feel like spending the evening scrubbing glitter and puffy paint out of your carpet. 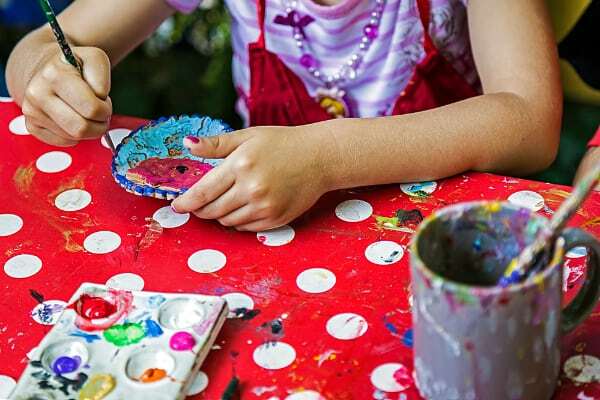 Paint, Glaze & Fire in south Overland Park is the perfect place for your family to get inspired, have fun, and create beautiful keepsakes without any mess in your own house. Don’t be intimidated if you aren’t feeling artistic. We have a ton of ideas to spark your creativity. With silk screen stencils, stamps, sponges, paint pens, tape that creates perfect stripes, speckled paint, and Jungle Gems* glaze with crystals for non-food items, you’re sure to find the inspiration to create your own masterpiece while your kiddos create theirs. What kinds of ceramics do they offer? We have a huge selection of ceramic pieces you can choose to paint including: plates, mugs, platters, figurines, holiday ornaments, and light-up Christmas trees. As soon as you pick your ceramics and paints, it’s time to get busy creating! You and your family will have a blast painting your pieces just the way you want them to look. When your work of art is complete, you’ll leave it with us for about 7-10 days (a little longer during the holidays). After your piece dries for 24 hours, we glaze it with care and then fire it for 24 hours in a kiln that reaches over 1800°F. That’s about as hot as a volcano! The result is a one-of-a-kind masterpiece that’s completely nontoxic and perfectly safe* for food. Be sure to preserve your treasure by keeping it out of the microwave and dishwasher. The fun doesn’t stop with painted ceramics! We also offer canvas painting, clay prints, and glass fusion. 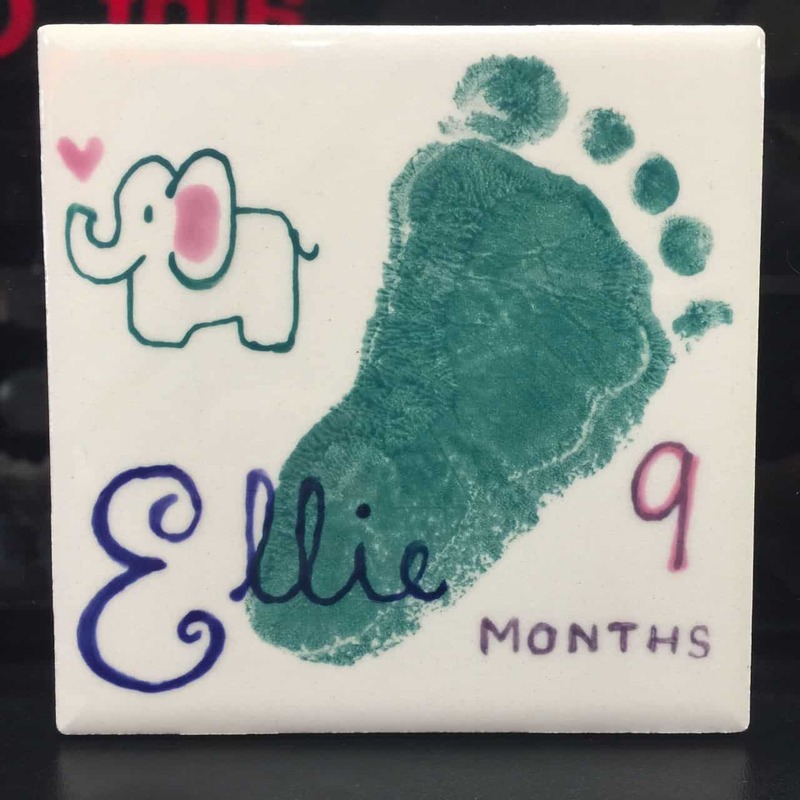 Free 4” tile footprints are available for children 18 months and younger so you can treasure your baby’s adorable little footprint even when the foot that made it has grown larger than your own. Glass fusion is a form of art in which you glue tiny pieces of glass to a flat glass base. There’s no end to the shapes, sizes, and colors that you can choose from. Just remember that kids will need adult supervision for this activity. When your project is complete, it’s fired in a kiln that reaches 1475°F. If you want it to be formed into a three-dimensional shape, such as a vase or a candy dish, we’ll fire it a second time over a mold that gives it shape. This process is called slumping. You can pick your work back up in 2-3 weeks; it takes a little longer than the ceramics because it’s fired twice. Don’t forget to enjoy a delicious coffee, latte, chai tea, or smoothie from our coffee bar. Small snacks are also available. We don’t offer alcoholic beverages, but if you choose to leave the kids at home to host an adult only event, you’re welcome to bring your own wine and glasses. Girls night out, team building workshops, and bachelorette parties are always a hit at Paint, Glaze & Fire. Space fills up fast as the weather turns cold, so be sure you get in before Thanksgiving to make your holiday gifts. The sooner the better! Reservations are recommended to ensure we have space for your group. Call 913-661-2529. Remember, there’s a per person studio fee for painting ceramics plus the cost of the pottery you choose to paint. Like us on Facebook @PaintGlazeFire.KC and visit paintglazeandfire.net for hours, discounts, and special events.